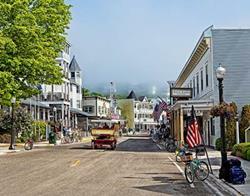 The Mackinac Island Festival of the Horse is a two-day celebration of the four-legged creature Mackinac is known for. Most festival events take place at or near the Michigan Horse Council Arena located at the Borough Lot below Grand Hotel. 6:30-7pm Come to the Round Island Bar and Grill balcony deck at Mission Point to enjoy a narrated start of the Festival of the Horse Carriage and Saddle Parade. Learn about the carriages and participants for a beautiful vantage point! 2pm $10 for adults, $5 for children 12 and under, 5 and under are free, breeds of Mackinac Presentation & Musical Performances by Betsy Van Dyke on her Danish Warmblood Tanner, Maryanke Alexander on her Friesian Regina and Michelle Stuck on her Friesian Gysbert performing to Let It Go from Disney's "Frozen"